Everyone who knows me knows that when it comes to CU football games, I am a “glass is half empty” fan. I can usually find a dozen reasons to worry about any opponent the Buffs face. If you had asked me the week of the San Jose State game whether I was concerned, I would have countered with details of a team with a Heisman candidate in Deonce Whittaker and a 7-5 2000 record. The best you can usually get out of me before a game in terms of a prediction is that I am “cautiously optimistic”. For some reason, though, the Nebraska game was different. Where the confidence came from, I can’t say, but I just knew the Buffs were going to win. Before I left Bozeman for the game, I asked my wife, Lee, to tape the game. In the late 80’s and early 90’s, when the Buffs were just re-entering the national stage, and seeing the Buffs on television was still something of a novelty, I taped a number of games. Since the ‘94 season, though, I hadn’t taped a single game. For some reason, though, I knew before I left Montana that I wanted a tape of this game. My outward confidence continued on gameday. At a tailgate party before the game, Randy and I caught up with fellow season ticket holders Brad and Scott. Scott is my opposite when it comes to predictions. For him, the glass is always half full. When he asked for my prediction, he was shocked at my answer. “That’s the kiss of death”, he muttered, certain that my change of attitude would doom the Buffs. Perhaps my greatest show of confidence came as we were walking into the stadium. Tony and Julie were going to the game, but the tickets I had obtained for them were in the bowl of the stadium. Tony asked where we should meet after the game. “The twenty-yard line”, I responded. When asked to repeat my response, I assured Tony he had heard correctly. “The twenty-yard line”, I repeated. Thirty minutes before kickoff, I was so confident that the Buffs would not only win, but that we would be able to participate in the post-game celebration down on the field, that I didn’t allow for any additional possibilities. It would be up to the Buffs to make me a prophet. The Colorado Buffaloes exorcised a decade’s worth of demons in one afternoon as the Buffs demolished the Nebraska Cornhuskers, 62-36, before a raucous crowd of 53,790 and a national television audience. #14 Colorado scored early and often against the nation’s #2 ranked team (#1 in the BCS standings), posting the highest point total ever allowed by a Nebraska team. Chris Brown rushed for 198 yards and a school record six touchdowns to lead the long list of Buff heroes. Bobby Pesavento completed only nine passes, but they went for 202 yards, including a 21-yard touchdown pass to tight end Daniel Graham. To compliment Chris Brown, Bobby Purify rushed 20 times for 154 yards and a score. In all, Colorado put up 582 yards of total offense, including 380 yards on the ground against a defense which had been allowing only 93 yards/game entering the contest. In the most recent CU/NU games, it was the Cornhuskers who habitually started quickly. In fact, in seven out of the past 11 games between the Buffs and the Cornhuskers, Nebraska had scored a touchdown within the first four minutes of game time a mind-numbing seven times. For the Buffs, who had lost the last five games to Nebraska by a total of only 15 points, a quick start was imperative. Nebraska took the opening kickoff, and on the first play from scrimmage, sophomore linebacker Sean Tufts tackled NU quarterback Eric Crouch behind the line for a three-yard loss. Two plays later, the Cornhuskers were forced to punt. Advantage, Colorado. On third down after taking possession, the Buffs hit on what may have been the most important play of the early going. Bobby Pesavento hit wide receiver Matt Brunson for a 26-yard completion to the Cornhusker 39-yard line. The play was significant as the Buffs, rather than give the ball back to the Nebraska offense, kept the ball and the early momentum. On the very next play, Bobby Purify dashed up the middle untouched. 7-0, Colorado. 12:17 left in the first quarter. What happened next to the Cornhuskers was – in a sense – familiar. The wheels fell off. What was unfamiliar to Nebraska and its fans was that this time, instead of jumping all over an intimidated opponent, it was the opponent which was taking advantage of the Big Red’s mistakes. On the Cornhuskers’ next possession, running back Dahrran Diedrick fumbled. It took the Buffs all of one play to score, with Bobby Pesavento hitting Daniel Graham for a 21-yard score. 14-0, Colorado. 11:47 to play in the first quarter. After driving to midfield on the ensuing drive, Nebraska went for a fourth-and-one. Eric Crouch slipped and fell behind the line of scrimmage, giving possession back to the Buffs. Pesavento promptly hit Graham on a 49-yard pass, and two plays later Pesavento did the honors from a yard out. 21-0, Colorado. 5:35 still to play in the first quarter. A long kickoff return set up a Nebraska field goal, giving the Cornhuskers and their fans some sense of normalcy. Then the Buffs turned to Chris Brown, and two drives later, both of which needed only five plays to cover 80 yards, Brown had two scores. Brown’s touchdowns, (the first from 12 yards out, the second from the one), gave CU a commanding 35-3 lead early in the second quarter. The remainder of the quarter was mostly left to Nebraska, with the Cornhuskers scoring three touchdowns to offset Chris Brown’s third score of the day. At the half, everyone stopped to collect their breaths as the Buffs took a 42-23 advantage into the locker room. Nebraska showed in the second and third quarters why they were the 2nd-ranked team in the nation. Falling behind 35-3 in the second quarter, the Cornhuskers fought back to make the score 42-30 late in third quarter. Nebraska dominated the third, holding the Buffs to three punts. Meanwhile, the CU defense bent but did not break. Nebraska drove to the CU one-yard line on its opening drive, only to have CU junior linebacker Drew Wahlroos force a Diedrick fumble. NU did score on a Crouch six-yard run on its next drive, but the 42-30 score was as close as the Cornhuskers would come. The play of the game occurred on the Buffs’ next drive. Pinned down on its seven-yard line, with momentum clearly in favor of the visiting team, the Buffs were on the verge of allowing a 32-point lead to vanish. Then quarterback Bobby Pesavento, who had been an afterthought coming into the 2001 season on the heels of Craig Ochs’ freshman campaign, made the play which turned momentum permanently back to Colorado. Dropping back to pass close to his own goal line, Pesavento saw his two tight ends, both running crossing patterns, collide into one another. Out of options, Pesavento took off. Not known for his quickness, Pesavento nonetheless scrambled for 22 yards and a CU first down. The Buff quarterback’s run put in motion a nine-play, 93-yard drive, culminated by a Chris Brown one-yard touchdown run, his fourth on the day, giving the Buffs a 49-30 lead with 12:50 to play. The comfortable lead quickly turned into a record-setting rout soon thereafter, as Eric Crouch was picked off by safety Michael Lewis and linebacker Joey Johnson on NU’s next two possessions. Both interceptions led to Chris Brown touchdown runs, and the scoreboard soon read an unbelievable 62-30. The only score in the last ten minutes of the contest was a seven-yard touchdown run by Eric Crouch, who would amass a school-record 360 yards of total offense on the day. The next afternoon, the BCS took another hit when Oklahoma State upset Oklahoma, setting up a rematch between Colorado and Texas. Texas now had the Big 12 inside track to the national championship game at the Rose Bowl. But the Buffs were not done wreaking havoc with the BCS computers. I had not been down on the grass of Folsom Field since the new turf had been laid in 1999. I had not been down on the field to celebrate a CU win in over a decade. It took some time to get down to the floor of the stadium. The students rushed the field as the final seconds ticked off, making quick work of the goal posts. For us in the 79th row, though, there would be a wait. No one moved towards the exits. No one moved at all. We just stood and watched. And yelled. And savored. By the time the four of us – Randy, Brad, Scott, and myself – made it to the stadium floor, many of the celebrants had moved on. That was fine with us. I took a run out to the 20-yard line, where I had told Tony and Julie to meet us, just to stomp the grass. It felt wonderful. Tony and Julie weren’t there, having more sense than the four of us than to fight there way down to the field, but we did take the time to have our pictures taken with the scoreboard in the background. (On seeing the pictures later, my wife Lee couldn’t help but remark how the grins on our faces made us look as if we were convinced that we had dispatched the hated ‘Huskers ourselves). Big smiles all around after the game! It was sweet. We caught up with Tony and Julie at the site of our tailgate party, and the celebration began anew with the group assembled there. Whereas the win over CSU almost three months earlier had brought a sense of relief, this win brought nothing but joy. 62 points – against Nebraska! It couldn’t possibly get any sweeter than that! Big 12 North champions after going 3-8! The bad weather predicted for the game had never materialized. It was cool, but pleasant. Still, it was late November, and the sun was long gone. After a quick beer and a few hugs, it was time to move on. Everyone was hungry, so we were off to dinner and more celebration. As we left the tailgate party, we walked in front of my old dorm, Libby Hall, just a few hundred feet from the stadium. I paused for a moment as the group started off for the parking lot. I looked back at the now nearly quiet stadium, brightly illuminated by flood lights. An occasional whoop or holler cut through the night. I heard a honk of a horn, but somehow I just knew it was a celebratory sound, not one made in anger. How could anyone be impatient at a time like this? Final score: 62-36. I just wanted to soak it in for a moment longer. I closed my eyes. I felt a smile cross my face. It was perfect. Through the cool night air I heard Brad call my name. I opened my eyes and hurried to catch up with my friends. This post, about the Nebraska game, from the 2001 Season, is filed under Game. There is a specific moment in the first quarter that resonates with me every time I hear, read or think about this game. It is the “game” for me, the one I enjoyed more than any other one (I have goosebumps writing this now), and cannot imagine enojoying one more than this one. As Bobby P hit Danny Graham and then did the honors himself to make it 21-0, the stadium was absolutely rocking. My wife and I were screaming but totally in shock at the same time. Amidst all the noise and chaos, as we embraced, she pinched me and asked, “Is this for real?” Then she added, “Could we make it 28-0?” We stared at each other in surreal disbelief again when Chris Brown’s second TD answered her question. There was that brief moment of “No f^&!%$g way? !” when Crouch cut it to 42-30, but Bobby P answered again. Each Chris Brown Touchdown after that was more surreal than the last. But the greatest moment was the first quarter pinch. In addition to my matching, previously white, now grey-yellow-y T-shirt and hat, I still have the VHS tape of the game, even though I own no VCR, and do own the DVD, and can access the game numerous places on the web. David, I’ve tried in vain to get a full video of the game with no luck. I have the DVD available from CU through Plati, but it’s a summary. Can you tell me where on the web it might be accessed? I attended this game as an outgoing Senior at CU, and therefore was the last time I would see the Mighty Buffaloes while still a student. I was privileged enough to see the CU Buffs beat the snot out of the Nebraska Cornbreeders 62-36. I’m not a fan of rushing the field, (Cue any game which CU wins now) However given the ramification that this game held I proceeded to help take the goal post down, and carried out of the North gate,(where we were stopped by security) On the way to carrying the goal post, I managed to lose my watch, wallet, cell phone and right shoe. But it was all worth it!!! Best game I’ve ever had the privilege of attending! Sean Tufts tackles Eric Heisman for a loss on the first play from scrimmage. Later, Justin Bannan buys real estate in the Husker backfield and D-Strick and Michael Lewis make plays in the secondary All Day Long. But the story of that afternoon was one of biblical proportions. Who can forget those gaping holes between the tackles, wide enough to plow an entire cornfield. The mammoth CU O-line, tight ends and Brandon “Shoulder Pads” Drumm bringing scripture to life in a parting of the red sea only Moses could have envisioned. Andre Gurode. Justin Bates. Victor Rogers. Wayne Lucier. Marwan Hage. Daniel Graham. Bobby Purify up the gut, untouched. Gash. Dan Graham on a crossing route with a Husker DB gnawing at his ankles before the Mackey Award winner leaves him in his wake on a one-way trip to the end zone. Gash. Chris Brown up the middle. Gash. A 35-3 lead in the first 18 minutes. People forget that we had a 78-yard TD called back on a penalty that was away from the play in the first quarter or that we could have added a touchdown in the final minute but instead called off the Dobermans in the form of a victory formation on the Corn’s 15-yard line. My dad and I wanted to hang 70 as every touchdown tasted and felt sweeter than the previous one. Folsom Field was in a frenzy, the loudest I’d ever heard it. Even louder than we remembered the 20-10 win over Nebraska in 1986 or the 27-21 CU win in 1989. In my mind I had already convinced myself that this was my favorite CU game of all time. The best part about it? There was no playcalling wizardry to the game plan, no Shrine Game (East/West) sizzle. The plan was pure Civil War — North to South, we were going to run at, through, over and past the vaunted Blackshirt defense. My favorite– and most memorable — play came in the second quarter on Chris Brown’s second touchdown run, a 1-yarder in the north end zone, little known to most. Gurode, the stalwart senior captain and pit bull of a guard who had experienced heartbreak in three prior losses to Nebraska by a total of 7 points, drove a poor Husker DB into the sponsorship stadium boards next to Ralphie’s corral beyond the north endzone, literally driving him into the wall. The best finish of a block I have ever seen. As the final seconds ticked off and torrents of CU fans, from generations young, old and everything in between, human hurricaned onto the Folsom turf, I couldn’t help but feel that the day would signify something to write about a decade later for those of us from Buff Nation who witnessed history. 62-36. MEMORIES — Something was in the air on Nov. 23, 2001. Driving into Boulder from my family’s home in Broomfield, the peculiar gray mist felt conspicuous. The palpable presence of drab radiated the paradoxical effect: The unexpected, for some inexplicable reason, felt as if on the verge of becoming reality. If ever you could concoct the perfect menu for a late autumn afternoon of football, this was it – crisp Colorado morning, no breeze, and a 1:30 kickoff that would lead to twilight by the fourth quarter. It was a flawless gameday. As a lifelong Buff Fan, I was fueled with unusual adrenaline for the game that would decide the Big XII North, 14th ranked CU against No.2 ranked Nebraska, who was also the BCS No. 1. For Nebraska, I was always amped. I grew up loathing the Corn, something that initiated itself with an experience I had as an 8-year-old in 1984. Upon walking out of Folsom Field with my dad – we’re 30-plus year season ticket holders — after a game but undermanned CU team lost 24-7 en route to a 1-10 season, a group of Nebraska fans who claimed Colorado roots taunted my dad and me for being ‘Loser Muff fans.’ This, my friends, is how allegiances are born. 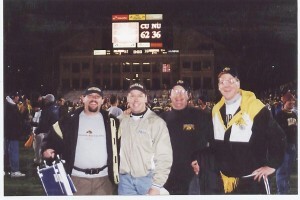 In addition, I was still smarting for not flying home from San Francisco, where I lived at the time, for Thanksgiving in 1999 and missing the epoch CU comeback that saw our Buffs turn a 27-3 fourth quarter deficit into a 27-all tie and a chance to win on a 33-yard field goal at the end of regulation. Jeremy Aldrich, though a great CU kicker over his career, missed a chippie. Wide right still stings today. But on 11.23.01, my level of fandom felt more lunch pail like-like than emotion-filled. After all, no pundits were talking about our team. The only blemishes on our record were two losses to two top 10 ranked teams — Fresno St. and Texas — in the first six weeks of the season. I remember watching ESPN the morning of Nov. 23 and hearing the GameDay crew talk about how CU has a solid team with solid talent but they will get trampled by Eric Crouch, the Husker O-line, and the Blackshirt defense. Walking into Folsom Field, the stadium lights were on prior to kickoff with the gray haze looming above the Flatirons. I was one Colorado Native who had turned into a NorCal resident by 2001 and I remember joking to my dad that I had brought the fog with me from San Francisco. There was a mesh of intensity and electricity in the air as we came out of the tunnel of Gate 10 and started walking to our seats in Section 219. Yes, the same very seats we sat in for the CU/NU game in 1984. I was 25 in 2001, a CU graduate and my dad was retired. When the Buffs came out in the all-black uniforms, the sense of anticipation had reached a crescendo, in the way only college football can manifest. FYI: At no time during the 2001 season was Fresno State ranked in the Top 15, much less in the Top 10, in any polls. According to the ESPN College Football Encyclopedia, Fresno State – after beating CU and Oregon State to open the season – was ranked No. 19 in the September 2nd poll in 2001. Then, after beating No. 23 Wisconsin, the Bulldogs moved up to No. 11. After a win over Tulsa, Fresno State moved up to No. 10 AP (No. 13 ESPN). Two more wins, over Louisiana Tech and Colorado State, moved the Bulldogs up to No. 8 AP (No. 10 ESPN). Only after losses to Boise State and Hawai’i did Fresno State drop out of the polls. Fresno State worked its way back to No. 20 in the last regular season poll, but a bowl loss to Michigan State dropped the 11-3 Bulldogs out of the final poll. My son talked me into a ‘road-trip’, so I purchased tickets for the CU-Nebraska game. I live in Mississipi and hadn’t been to a CU game since 1984. I guess we picked a great one to see in person. My son was blown away and I couldn’t quit yelling. We went down onto the field and wandered around and basked in the true joy of kicking Nebraska A_ _ !!! One more great memory of going to school in Boulder and working with the Buffs. So if you taped this game, would it be possible for you to post the game in its entirety on youtube? i saw someone posted our fiesta bowl win against notre dame in coach mac’s last game and would love for someone to put the 2001 CU Nebraska game online. not just the highlights. It was the greatest day of my life after all.